Jim Stear added the flying carrier to the Second Great War at Sea story line, and they definitely cry out for their own version of the Fancy Carrier Card. 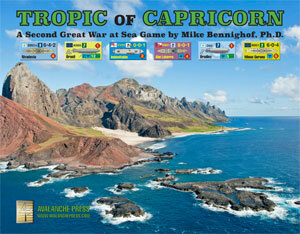 Down below are cards for the flying carriers of SGWAS: Tropic of Capricorn. They’re in color, with the basing boxes (use them just like the plain ones on the generic carrier sheet included in the game - which doesn;t even have airship icons on it!) plus the airship data from the hit records. You can mark off hits with counters or coins, or slip the card into a sleeve and mark on it with a grease pencil just like a real staff officer. Mike Bennighof is president of Avalanche Press and holds a doctorate in history from Emory University. A Fulbright Scholar and award-winning journalist, he has published over 100 books, games and articles on historical subjects. He lives in Birmingham, Alabama with his wife, three children and his dog, Leopold. Leopold enjoys biting sticks.